A commissioned Communion Set that I finished last week. I dipped the plates and used a rubber rib to scrape off the extra glaze, revealing the color of the clay, with the glaze filling the calligraphy areas. They will go into service at a church in the area. Yesterday was a great throwing day. The studio looks so clean from the front to back mopping/cleaning that I did in preparation for the show that it was a joy to start a new series of work. It was nice to see everyone that came out to my Spring Open House and send them off with special pieces of pottery. 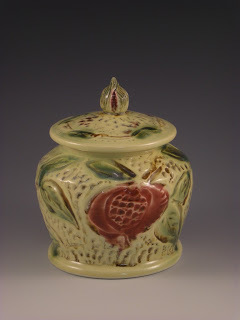 I was a bit sorry to see the little yellow pomegranite jar go--didn't even get a print size image of it. 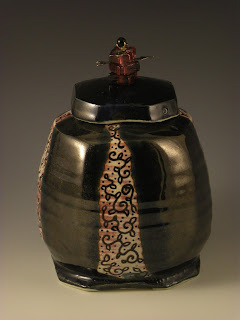 One of the dangers of bringing work out of a very recently fired kiln and it just leaping out the door to a new home. Oh well, make another and explore the idea more, I suppose. Right now I'm working on a set of communion plates and a baptismal basin and pitcher for one commission, some dinnerware for another, and 170 sauce bowls for a wedding in Sept. You may see the count down of those puppies here as the weeks wind forward. I read in the most recent Ceramics Monthly about "owning" a form. I think I will "own" that little sauce bowl by September. "Own the forms you long to create, own your life as an artisan, own the space and moments of your creation, and you will own your dreams." I got a lot of movement on the yellow glaze I call "Vic's Yellow". 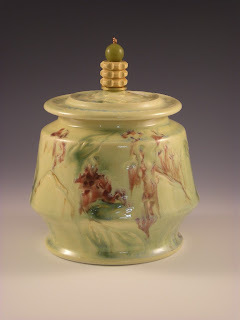 I had painted a copper wash on the leaves of the yellow jars, and added a red and purple glaze for the blossoms. Well, everything started to move a bit. I was very pleased with these guys. The last one looks very watercolorish and soft. The stupa jar has the Gosu black around the rim of the top. It is washing out more than I would like, especially on some other pieces not shown here. More experimentation needed. Camera wise, I tried cutting down some of the light exposure to get more drama. It seems to work ok on these, but don't know how it would appear as a print, rather than just on the pc screen. I didn't take larger images for print since I wanted to get these up on the blog. Another project. A few of the covered jars that will be at my Open House/Studio Sale this weekend. There will be more tomorrow as I get all the images loaded from my little photo shoot Tuesday afternoon. 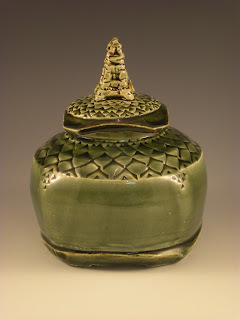 You can see the green and blue pots in their greenware state a few blogs back. The assembled knobs are a combo of copper wire, brass plumbing parts, glass beads, etc. I have been out of town enjoying warm weather, thinking about pottery and reading a wonderful book called A Single Shard by Linda Sue Park. Hope you go to the link because it has a beautiful cover of the book. This was a 2002 Newberry Award winner and there are ones with different cover art on Amazon, but I just loved the cover at the link (and it's the one I am looking at on my desk). Set in Korea in the 12th century, it is a wonderful story of a young boy, an old potter and the mystery that happens when clay, fire and inspiration all come together. Would have taken a picture for ya, but I am behind, pressed for time, etc! Good Reading!! I should have some previews of new work on Wed. or Thursday before the open house! Lovely blueberry/buckwheat pancackes with a blackberry and walnut topping, next to a cuppa Earl Grey. I'm pondering the "Mystery Art" that Cleveland Co. Art Guild is having. My two paintings are done and I will be mailing them today. Can you see them, you say? No preview for you--it's a mystery! But they will have them online, so check out the website. Why are you painting, you're a potter!" say you. My BFA in painting and drawing begs to disagree, though sadly, it was never put to any professional use. Beware of texture--it can be dangerous to your health. I think about texture alot. It shows up all the time on my pots and in everything around me. My husband will vouch that one of my mantras is "I might need that for something". Right now the clogged up paper shredder is sitting on my desk while I try to figure out how to get inside of it and see if the little shredding wheels might make a nice texturizer. The warning not to open the top because it can't be "self-serviced" has prevented me from taking the hammer to it. Now, to be fair, I have tried many times to unclog the shredder but it justs gets back to a great wad of mawled up paper that won't release in any direction. So I decided I was done using it in it's original state and it was time for that office appliance to move into the world of creativity. But that sticker is bothering me enough to dampen my enthusiasm for exposing the hidden secrets below the plastic cover. My caution in this is because I witnessed my son-in-law trying to dismantle a disposable camera at a diner in rural Mississppi several years ago. It had a similar warning on it. When it exploded with a small flash and a really big bang we all had to sheepishly pull ourselves out from under the table where we dove (not the bird but the past tense of dive) for cover. It sounded a lot like gunfire and I think everyone thought the diner was under attack. This thing is a whole lot bigger than that disposable camera. All that calligraphy and illumination I learned about in art history is getting some use. A load of covered jars after trimming but before carving. Little spiral motif and pomegranite. 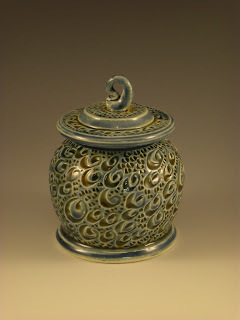 I love making and carving these jars. However, they are really time consuming and I get fussy with the lids and trying to get a nice fit. These bottom ones will have a "mixed media" knob assembly. I like to put a handle with an impressed texture on these "S" profile mugs that I make. First I start with an extruded coil of clay about 1/2" thick. I use one of the hand-held extruders to make these coils. I extrude about 3 coil lengths at a time. Any more and they seem to dry out and get surface cracks before I am ready to decorate them. I take the extruded coil (about 3.5" long to start with, and elongate it by rolling, trying for a tapered end. You can see the lug that I started with next to the rolled and thinned coil that I will use for the handle. Now I flatten the coil by using a paddle and pressing down. Texture is applied after flattening. I enjoy this rolled texture, which is a napkin ring. I use a stick to press the edges down and give me a crisp end to the texture. There is usually a bit of texture impression on the edges, which I smooth out gently with my finger and not using water. Another favorite texture tool--pen cap! After the handle is textured, I gently shape into a question mark and let set up while I finish the next two handles. I like to tap the top edge of the handle into a 45 degree angle using my paddle, then score both the handle and the cup. A light application of vinegar over the scored marks helps to adhere the handle. After attaching top and bottom, I make sure the seam is cleaned up and neat, then set the cup upside down to let gravity form the rounded top of the handle. I cover the mugs overnight to let everything equalize in moisture, then dry right side up in the open air of the studio.